The Dream Angel Oracle speaks to you with the mystical language of dreams, giving you spiritual guidance and gentle ways to change your thinking and feelings so you can improve your life. They are like Guardian Angels and are constantly waiting to talk to us. Many times, they materialize in mystical dreams, in the form of friends and other guides who look familiar and inspire intense feelings and emotions. The whole idea of our Higher Self is to help us with words of encouragement and guidance. Higher Self sometimes appears as Dream Angels during our dreaming state to help us connect to the great strength of our Human Spirit and find solutions to problems, ease pain, be comforted and uplifted. While our Higher Self speaks to us in our dreams, it is sometimes hard to communicate with them. We are so caught up in the dream that we tend to view it like a movie and miss the opportunity to interact. 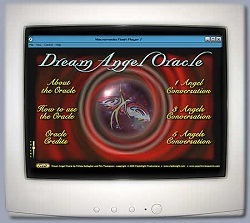 Now, thanks to the Dream Angel Oracle, we can communicate with our Dream Angels easily while we are awake, just as we do with our friends through our computers! We can hold conversations, ask questions, or just talk, and ALWAYS we will receive words of inspiration, love, compassion, and support in return. What is the Dream Angel Oracle? The mystical Dream Angel Oracle divination software helps you call your personal Dream Angel Spirit Guides to you while you are awake, through the power of computer interaction. You just type your question or comment for the Dream Angels and they reply though this unique divination software engine that is filled with inspirational sayings which become perfect for the moment and situation. You can now easily listen to the words of inspiration from your guardian angels and follow their advice. Through the Dream Angel Oracle, the dream guardian angels send you beautiful mystical words of inspiration filled with hope, comfort and profound advice. These messages suggest ways to clear confusion, cultivate harmony of spirit, and increase your effectiveness of your life. Leave a Reply to Lavenia Wissink Click here to cancel reply.